Show-off with a show-boat shine on your aluminum! Restores oxidized aluminum boat rails, hulls, and pontoons. Protects your aluminum with a protective film. Works well by hand or with a machine polisher. 3M Marine Aluminum Restorer and Polish restores the luster to oxidized aluminum boat rails, hulls, and pontoons. Aluminum surfaces on boats become stained, oxidized, and discolored as a natural reaction to the elements. 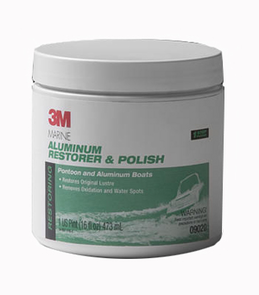 3M Marine Aluminum Restorer and Polish is recommended for removing surface rust, oxidation, corrosion, and tarnish on aluminum. It is also recommended for stainless, steel, brass, bronze, copper, chrome, and other marine metals. Aluminum Restorer and Polish has a light abrasive action that will restore the original luster of the aluminum and will remove oxidation. High gloss will be returned to parts with original high polished surfaces, while brushed and matte finishes will be restored to original color and luster. 3M Marine Aluminum Restorer and Polish can be applied by hand or with a polisher. When polishing bare aluminum, a black residue appears as the oxidation is removed. Be sure to have plenty of applicators and towels on hand. If using a polisher, use a foam or wool pad on large surfaces. For railings or tight areas, use a foam or microfiber applicator pad. Buff off the residue with a soft Cobra All Purpose Microfiber Towel. Use 3M Marine Aluminum Restorer and Polish sparingly. A little goes a long way. Restore marine metals to a like-new luster with 3M Marine Aluminum Restorer and Polish. Works great on marine aluminum. Think it would work better using polisher instead of by hand but to each their own.